While there are numerous well known "Law of Attraction" authors and books, many from nearly a century ago, including Charles Haanel of the Master Key System, Wallace Wattles, William Walker Atkinson, Napoleon Hill, Charles Fillmore and many others, which later gave rise to the movie "The Secret"as well as influencing famous people such as Edgar Cayce, Nicola Tesla and others, ultimately there is only one source of their knowledge, The Baron Eugene Fersen. This great man who either taught or influenced all the aforementioned in Metaphysics, Law of Attraction and much, much more. Although all these later authors went on to make a name for themselves, often modifying or adapting the original teachings, if you are looking for just one, original, authentic source you can trust, The Baron Eugene Fersen, Teacher of Teachers, author of the great work, Science of Being In Twenty Seven Lessons is the ONLY TRUE, Original and Complete Law of Attraction book you will EVER need to bring to you Achievable Abundance, Health And Happiness. Amazon reader review: 5.0 out of 5 stars Finally...the works are known! Many thanks go out to Adrian Cooper for bringing the works of Baron Eugene Fersen to greater public awareness. I remember discovering the Science of Being body of work back in 2004. How astonished I was to find that I couldn't find much information about this great man or his organization, the Lightbearers. So I started a small crusade to increase awareness because when I put Fersen's teachings in to practice, I found my life changed for the better. The Science of Being body of work needed to be discovered by all! The Science of Being in Twenty Seven Lessons is my favorite work by Baron Eugene Fersen because it is practical in application. Adrian Cooper has treated the work with the respect it deserves( and credits the source very clearly). If anyone is waffling on whether to buy this book, go with your gut. You won't regret it. This work is profound and the best book on the Law of Attraction you will ever read. Blessings to all who read this review and the Science of Being. This first lesson, right from the very outset teaches the fundamentals needed for complete, long-term success. Without this all of your efforts will be diluted or even wasted. This lesson concludes with two fundamental exercises to be acquired by you first - RELAXATION and SILENCE - without which no other exercise can be properly performed. Only when the body and mind are completely relaxed can you get what is called a real rest, for only then are you in the most ideally receptive condition. All the gates of your body and mind are then opened to the inflow of that supreme Universal Power called Life Energy. 1. What are the fundamental Principles of Being? 2. What are Forces of the Universe? 3. What are the Laws which govern them? 4. What is Universal Life Energy and where is it to be found? 5. What are its main aspects? 10. What is Man's relation to Nature and to Universal Forces and Laws? 12. How can it be removed? How to contact and secure a constant flow of Universal Life Energy. Without knowing this most most of your efforts are wasted as you may well have discovered by now. Failure to understand, assimilate and engage in this lesson is a primary reason for failure to achieve all wishes, needs and desires. It is absolutely impossible to over-state the crucial importance of this lesson during which a very, very powerful and simple exercise that anyone can easily do is introduced, a simple exercise taking only a few minutes but which will, in and of itself make a profound difference in your life and ability to attract and express. 1. What are the methods of contacting Universal Life Energy? 2. What is the role of the Life Centre in connection with Universal Life Energy? 3. What is the role of the Solar Plexus? 4. What are the advantages of the Mental Contact? 5. In what way is the Mental Contact limited? 6. What are the advantages of the Physical Contact through the Star Exercise? 7. Are there any other means of physically contacting Universal Life Energy? 8. What is the best mental attitude to take during the Mental Contact and the Star Exercise? 9. How can one grow stronger in Body, Mind, and Soul by working? 10. Do animals contact and use Universal Life Energy for their daily needs? 11. What is the quickest way to develop man's latent powers? 12. Why does Universal Life Energy establish equilibrium within? This lesson takes a look at some of the success of the greatest members of humanity, and how they applied these powerful Universal forces and Principles to achieve their own success. If you wish to succeed, then you will definitely need to take note of these powerful examples of people that truly understood the need to apply these crucial Universal Principles in order to achieve great success. 1. To what basic cause must be attributed the achievements of great men and women of all time? 2. Were they conscious of that cause? 3. If any were, name several. 4. How far back in human history can the use of Universal Life Energy be traced? 5. Was this knowledge of how to use Universal Life Energy general or was it restricted to- a few individuals? 6. If restricted, why was it not made general? 7. What has been the effect on nations of the capacity of its leaders to use Universal Life Energy? 8. Was this knowledge limited to any particular countries, religions, philosophies or sciences? 9. In what human activities is the use of this Power impossible? 10. Will the use of this Power in modern times lead people to Success? 11. Has the success of prominent people ever been easily attained? 12. What is the simplest and most practical way to rise to prominence? This lesson begins to explain the secrets of the physical body in relation to our inner and physical states of Being. If you are seeking perfect health and a perfect body, this lesson will begin to show you how, fr beyond other Law of Attraction books.. In this lesson you will discover the true secrets of attaining the perfect body that you have always longed for but not yet achieved, no matter what you do. Lesson Four also introduces an important new exercise. In addition to the Exercises given to you in the previous lessons—the Star Exercise, Relaxation, Silence and Contact—there is a new Exercise, STIMULATION. The object of this new Exercise is to teach you to use nerves, to contact Universal Life Energy, and by the reaction of Universal Life Energy in its stimulation of all cells and tissues, to make those wireless stations function ever more strongly. This Exercise will help you also a great deal in in the work of harmonization of your physical body. This knowledge is crucial for success, especially for healing and health. 1. What does the physical body as a whole represent? 2. What are the Forces and Laws back of physical development? 3. What is the best way to acquire a strong and healthy physical body? 4. In what way has Nature equipped the body for contacting Universal Life Energy? 5. What Centre within the body exercises the greatest power of attraction for Universal Life Energy? 6. Why does Universal Life Energy not flow continually into the body of every one? 7. On what does the general well being, strength and harmony of the body depend? 8. What essential qualities must one cultivate in order to build a harmonious body? 9. What are the two ways of bringing out the latent qualities of one's Individuality? 10. Is old age an impediment to the harmonization of the physical body? 11. What diet produces the most desirable results in the human body? 12. What mental attitude must be observed in performing physical exercises if benefit is to be derived from them? The Science Of Being World Center would like to thank Mr. Adrian P. Cooper for recognizing the Great value of these most profound teachings and The World Teacher who brought them to Humanity and for sharing in our mission to bring this Wisdom out to the world in this time. We, the Acting Head Lightbearers, would like to wish Mr. Cooper continued success assisting humanity in its quest for the education of self enlightenment and Liberation. 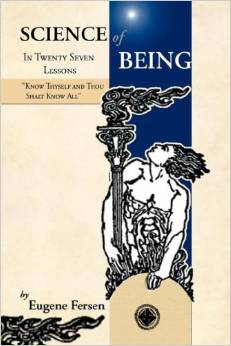 We would also like to publically express great gratitude for his most humble acknowledgement in his written Dedication for and of the Science Of Being Lightbearers World Center in this publication - it speaks volumes of professional "Divine Moral Integrity" in this day and age where it is sadly lacking. Mr. Cooper and the others, who expressed a thought here, have shown a heartfelt display of "Divine Moral Integrity" and we are glad to see that it is on the up rise. With and where there is "Divine Moral Integrity," there is hope for Humankind. Mr. Cooper, you did an Excellent and Beautiful job with the book, we appreciate and applaud your superb effort. "May The Flame Of Love Always Light Your Way"
This lesson deals with the reasons and solutions for lethargy, lack of motivation and achievement, resulting from a poor contact with Universal Life Energy. If you have been feeling lethargic, or a lack of motivation or "going nowhere fast", this lesson will be of enormous benefit, and anyway is absolutely fundamental for complete success. 1. What common difficulty encountered in the performance of one's daily duties can be eliminated by the use of Universal Life Energy? 2. How are those duties most easily and efficiently performed? 3. Is it possible to work without getting tired? 4. What specifically will be the effects of the use of Universal Life Energy on the human body? 5. How may it be used on the farm? 6. In what way does the cause of diseases differ in animal and plant life? 7. What different ways are there of treating animal and plant life with Universal Life Energy? 8. What way is most efficient, and why? 9. Is the procedure always the same? 10. What effect does distance have on the sending of Universal Life Energy? 11. In what other very important respect can Universal Life Energy be of benefit to the farmer? 12. What advantages are derived from the use of Universal Life Energy in factory work? This lesson describes how these crucial Universal Principles relate to business and business success, and the consequences to your business and therefore your wealth of not applying these Principles. If you manage your own business, or are considering doing so, this Lesson will prove to be absolutely invaluable in the Law of Attraction. 1. What essential element in business training do commercial schools and teachers of business psychology fail to provide? 2. What qualities neglected in the teaching of the theories of business are necessary to achieve success? 3. How can they be developed? 4. Why is the application of theories to actual conditions so often a failure? 5. What are the main difficulties encountered by salesmen in approaching a prospect? 6. How can those difficulties best be overcome? 7. How can a salesman render his articles more attractive? 8. What two important points are to be observed in business and salesmanship? 9. Explain how the attempted misuse of Universal Life Energy reacts against the offender. 10. What main advantage is derived from the use of Universal Life Energy in business and salesmanship? 11. What results will an employer achieve by using Universal Life Energy in his relation with employees? 12. How does Universal Life Energy operate to attract customers, decrease wastage and facilitate business? This lesson addresses the many issues faced by students and teachers in the context of Universal Principles, and how they can be resolved and improved. This lesson also adds a valuable new exercise called INVIGORATION- another crucial element of Success. 1. What is the general complaint of educators today? 2. Is this complaint justified, and if so to what must the fault be attributed? 3. Why is it that most teachers are not producing the desired results with their students? 4. What is the reaction of other minds to a mind permeated with Universal Life Energy? 5. What is usually the cause of mental deficiency? 6. How can mentally sluggish and backward children be restored to normal? 7. To what are exhibitions of temper and perversity in children due? 8. How should they be handled? 9. What practical results will teachers obtain for themselves by using Universal Life Energy in their work? 10. What advantage will students derive from using Universal Life Energy in their studies? 11. In what way is the use of Universal Life Energy in sports and athletics particularly effective in securing the desired results? 12. What is the most important practical knowledge for a coach to possess? This lesson deals with the subjects of poverty and lack, their causes and how to deal with them effectively using fundamental Universal Principles. If you are currently experiencing lack, or even living in conditions known as "poverty", then this lesson will help you enormously. 1. What is the fundamental Cause of Poverty? 2. How does this Cause express Itself? 3. How can it be overcome? 4. What are the physical channels through which the qualities of the individual are expressed? 5. What determines the degree to which those qualities are manifested? 6. How does the original undifferentiated current of Universal Life Energy become differentiated in the individual? 7. What role does environment play in the development of a child, especially in relation to its financial brain center? 8. To what three immediate causes may the inability of any brain center to function be due? 9. Why are purely mental methods for overcoming Poverty inadequate? 10. How can Abundance be most successfully demonstrated? 11. What attitude in giving prevents the operation of the Law of Compensation? 12. What is the understanding of Money essential for true giving? This lesson addresses the issue of ageing and "old age", what causes it and how to slow or even stop it. For anyone in advancing years or who wishes to remain young in body, Soul and Spirit, this is a crucially important Lesson. The process known as "ageing" is not inevitable. Learn how to deal with ageing once and for all as well as to regain your youth. Ageing is not inevitable - learn why and how to control ageing in this powerful chapter. 2. How is it related to the progress of Humanity? 3. What is the keystone of Health? 4. To what specific bodily condition are most physical troubles due? 5. How can those troubles be eliminated? 6. Should will power be used in that elimination? 7. What is Magnetic Chemicalization? 8. What is Old Age? 9. What kinds of causes are responsible for Old Age? 10. To what fundamental cause can all others be traced? 11. To what part of our triune nature is Old Age restricted? 12. How can Old Age be overcome? This lesson teaches you about the crucial importance of the Mental Plane of Life, how it benefits you and how to connect and also introduces the extremely important and crucial aspect of Mind called Subconsciousness. Learn why the term Subconsciousness is more correct than "Subconscious Mind". This lesson also adds two very powerful and valuable new exercises - ATTENTION and CONCENTRATION. 1. What and where is Universal Mind? 2. What is Cosmic Consciousness? 3. What is the individual mind? 4. How does the single individual mind express itself? 8. What are the physical organs respectively through which these three aspects of Mind express themselves? 9. Where do ideas originate and how are they conveyed into our Consciousness? 12. What is Mental Concentration? This less expands on the crucially important subject of SUBCONSCIOUSNESS and reveals facts of what is known as the Subconscious Mind. This lesson also introduces another importance exercise called FERTILIZATION which teaches you how to communicate properly and effectively with the sphere of activity of Mind known as Subconsciousness. 3. What two distinctive qualities does it possess? 4. How does Subconsciousness react with the Conscious Self? 5. What are the qualities and limitations of the Subconsciousness? 6. In what respect is it dangerous to the individual? 7. How can Subconsciousness be consciously controlled? 8. What are the two methods for purifying Subconsciousness? 9. Which of these methods is limited, and why? 10. How do Negation and Realization operate on the Mental Plane? 11. Should any definite sequence be observed in the application of the two methods of purifying Subconsciousness, and why? 12. What is the method and the result of Fertilization of the Subconsciousness? This lesson teaches another important aspect or quality of consciousness - Selfconsciousness. This has nothing to do with being "self conscious" in the normal meaning of the phrase, but rather being conscious of Self which is very important for further progress. 2. What are its distinctive qualities? 3. To what extent are we conscious of all the thoughts and impressions we receive? 5. What is Common Sense? 6. What is Self Analysis? 8. What is Fear, its causes and effects? 9. How can Fear be eliminated? 10. What relation do the conscious faculties bear to Fear? 11. Define Will Power and its development. 12. What is liberated thought? This lesson introduces some very important Principles and lessons on the subjects of Character Reading and Thought Reading. Included in these important subjects are FORESIGHT and INSIGHT. This lesson also introduces a new and valuable exercise - OBSERVATION. 1. What is Character Reading? 2. To what extent is the body an accurate indication of the character within it? 3. Is the character subject to physical limitations? 4. What role does Universal Life Energy play in Character Reading? 5. What attitude is necessary in order to read other people's character? 6. How can one read the thoughts of others? 7. What are Insight and Foresight? 8. How can they be developed? 9. What is Self Reliance and how can it be developed? 11. What it its practical value? 12. How can it be developed? "SUCCESS—what a magic word! How appealing to everyone! In its syllables are caught the hopes, dreams and ambitions of all the World. To attain it means to overcome obstacles. To possess it means Mastery, Power". This lesson goes on to show you how true, enduring success can be achieved. If you have always wished for success but not yet achieved it, this lesson will show you the way. If you have longed for Success and have not yet achieved it, or wish to build on your current success then this is a very important lesson for you to learn. 2. Is it restricted to any special department of life or activities? 3. What purpose is served by the obstacles in the way of its realization? 4. What are the two natural Laws most intimately related with Success or Failure? 5. How can the individual perceive and take advantage of these Laws? 6. What exceptional advantage does a knowledge of these Laws confer in the business and financial world? 7. What is the Law of Cause and Effect? 8. Is the theory of Predestination correct? 9. Can man build his own Destiny? 10. Is there such a thing as blind Chance? 11. How can the negative aspects of all the above three Laws be avoided? 12. What two human qualities are essential to achieve Success? This is an extremely important lesson for The Law of Attraction, and one that you my well already be familiar with from other books and resources - Creative Thought. Creative Thought is a absolutely fundamental to success - but must be done correctly. The end of this lesson introduces a valuable new exercise - VISUALIZATION. You will undoubtedly heard of Visualization before. What you may not have discovered before is how to learn visualization correctly and effectively. 1. What is Creative Thought? 2. How is Concentrated Thought made Creative? 3. On what does the measure of any individual's Success largely depend? 4. Are Progress and Achievement products of the Creative Thought alone? 5. What is the medium through which the Creative Thought actually embodies itself in material expression. 6. What important advantage results from the proper cooperation between Mind and Body? 7. What is the cause of Timidity, Indecision and Procrastination? 8. How can they be eliminated? 9. What is Suggestion in its various aspects? 10. What is its main effect upon the individual? 11. Are Affirmations effective in curing negative conditions? 12. How can mental qualities be best developed? Science Of Being In 27 Lessons is a "sacred" book no individual being of "body, mind and soul" living on this earthly planet can ever live without, in order to achieve one's life mission and objective of Individual Calmness & Inner Peace, Harmony, Success, Happiness, Health, True Abundance and Self-Determined Power. An abundance of true knowledge and practical life application contains in each and successive lessons help guide individual being to achieve such mission and objective. The Author of this book is by no means an ordinary person...He is truly a MASTER "REINCARNATED" to help Humanity awakens their present state of human consciousness in the wake of current Global Economic and Financial Melt-Down. In this lesson you will be introduced to the true meaning and significance of money and the factors that attract or repels it. Money is one of those things that many if not most people deeply desire, but very few truly attract in quantity. If you ever wondered about how to really attract money, then this lesson is where you will learn. 2. How can it be acquired? 3. What is the Law of Compensation? 4. Through what channel in the individual does it operate? 5. On what initial activity is the ability to make Money conditioned? 6. What two negative influences are mainly responsible for neutralizing this activity, and how do they act upon it? 8. What fundamental cause of Poverty can be avoided by conforming to the Law of Compensation? 9. Explain the "evil power" of Money. 10. How should Money be regarded by the individual? 11. What is the crowning heritage that a rich man should impart to his children? 12. What fundamental Power determines the scope of all the activities described in this Lesson? This is another extremely valuable lesson which will no doubt be of great importance to many people - Healing and Health. In this lesson you will learn all the factors that relate to healing and health, and how to use the power of the Mind in the correct way in order to achieve them. If you experience any ailments that you would like to heal, or simply desire perfect health always - this lesson will show you the way. 1. What significant change is now taking place in the diagnosis and treatment of diseases? 2. What is the relation of Mind to the material Body? 3. How can physical disharmonies of any sort be eliminated? 4. What is the danger of entertaining unkind or destructive thoughts? 5. How are physical troubles classified in relation to Mind? 6. What is the chief obstacle to overcome in healing all troubles? 7. What is the treatment whose application in various ways is most effective in correcting ill health? 8. Describe briefly the principle of mental diagnosis of diseases. 9. Can Will Power, in the form of Suggestion or any other way, cure diseases permanently? 10. In what respects are absent treatments superior to present ones? 11. What does mental self-protection accomplish for the individual? 12. What is Mental Chemicalization? This is the last but by no means least lesson dedicated to that aspect of our Triune Being collectively known as Mind. Here you will commence your journey beyond the outer levels of Consciousness to attain the highest level, the Superconsiousness of Cosmic Mind and Inspiration. This lesson introduces another very important exercise - POLARIZATION. 1. What is Cosmic Mind? 2. How is it distinguished from Subconsciousness? 3. Through what channels, mental and physical, is it connected with Consciousness? 4. What Law is put into operation in contacting Cosmic Mind? 5. What condition must prevail in the individual to enable that Law to function? 7. Define its relation to Reason. 8. What is the EVER PRESENT NOW? 9. Of what value is the Past? 10. What is the danger of the Future? 11. How are Power and Greatness achieved? 12. How is it possible to become a MASTER MIND? In this lesson we progress to the third and final aspects of our Triune Being - The Soul the foundation of our personality and current physical existence. At the end of this lesson follows an extremely important exercise - MEDITATION. Meditation is an extremely valuable ability that everyone, without exception needs to learn and commit to. This lesson will show you how. Here you will also learn about the state known as "death" and how it may be eliminated. 1. From what point of view has the Soul generally been regarded? 2. Why has this explanation failed? 3. What perceptible proofs of the Soul's existence and qualities exist in the human individual? 4. Define the Human Soul. 5. Is the possession of a Soul restricted to human beings? 6. What position does the Soul of Man occupy in relation to the rest of Nature? 7. What differentiates the Human Soul from all others? 8. In what respects does Universal Brotherhood become apparent? 9. What purpose does the Soul represent in Material Existence? 11. What is the Natural Law governing all Life? 12. How will Death eventually be eliminated? Amazon reader review: 5.0 out of 5 stars A must study for all! The lessons are an in-depth look and practice guide in helping us to uncover all the layers inside of us, awaken us to the truth of God and His Universal Laws, and understanding our roles as humans in living within them. A must have book! As with previous lessons, this is another crucially important lesson to learn and understand - the relationship between the Soul and its corresponding physical body. The conclusion of this lesson brings a further important exercise to add to the preceding ones - EXTERIORIZATION. 1. What is necessary to develop the stronger physical expression of Soul qualities? 2. Where is this to be found? 3. Why do people often shrink from meeting problems that confront them? 4. Will you ever encounter a problem that you have not the possibility to solve? 5. Of what does Progress consist? 6. Of what importance in the development of secondary qualities are the Four Fundamental Qualities of Life, Mind, Law (Truth) and Love? 7. What purpose does Superconsciousness serve in this process? 9. What determines the sort of Soul to be born to prospective parents? 10. How are the Male and Female Principles in your Soul indicated in your physical Body? 11. How can the physical Body be modified in form and outline? 12. What dominant Purpose is suggested by the general arrangement of the Body organs? In this lesson you will be introduced to your true Self - that aspect of self that transcends mere materialism. You will learn how to fashion your Personality in order that it can become a true vehicle and expression of Being for your inner, eternal Individuality, and thereby learn the true secrets of realizing your needs, wishes and desires in the physical world. The exercise you will learn after this lesson is both extremely important and equally misunderstood - MANIFESTATION. Finally discover the true Science of Manifestation and how everything you have learned to date is probably wrong. 2. In what vital respects does it differ from Personality? 3. How can Individuality be best developed into expression? 4. What is the essential first step in seeking out the right environment for your Individuality? 5. How is self Knowledge to be acquired? 6. How can the example of great men help others to bring out their Individuality? 7. How is the value of the position occupied by any individual determined? 8. Of what does 'Independence consist? 9. When will the ideal of real Brotherhood between men and nations be possible of achievement? 10. What is the purpose served by Standardization in relation to Individualization? 12. How can Freedom be obtained? This lesson brings to you teachings on that aspect of your life on Earth - Personality - who you Are. Lesson Twenty Two brings another very powerful and important exercise - MAGNETIZATION. The purpose of MAGNETIZATION is to attract, by the exertion through your intrinsic qualities of a sufficient Force, the elements for their material expression and realization. 2. How is Personality related to Individuality? 3. What practical results are obtained by adapting Personality to Individuality? 4. Where should this re-adjustment start? 5. What relative importance do material surroundings bear to this process? 6. What are the distinctive attributes of a real Gentleman? 7. What qualities must Women develop in order to attain equality with Men? 8. What qualities must be cultivated by Men in order not to be outstripped by Women? 9. In what vitally important respect does the use of Universal Life Energy help reconstruct your Personality? 10. What are the distinguishing features of a well balanced Personality? 11. To what single vital Fundamental do all the varied activities of human life finally reduce? 12. Define Leadership in its relation to the Law of Evolution and ultimate end toward which it tends. In this lesson you will find a review of the most important lessons on Universal Life Energy and significance to you and the Soul Ray. At the conclusion of this exercise you will also be given a further valuable exercise - PURIFICATION. 1. What is the Soul Ray? 2. How can it be contacted? 3. In what way does the Soul Ray serve to test your harmonious development of character? 4. What is the advantage in starting at the bottom and working up to positions of greater power and responsibilities? 5. In what way is the individual responsible for any negative conditions he may experience? 6. Why is it unwise to rely wholly on others to cure negative conditions in yourself? 7. What is the great drawback to exaggerated development on any one of the Three Planes? 8. Where are the original Causes of all discord you may suffer to be found? 9. How can evil passions be eliminated? 10. What may be the effect on you while the Negative in you is being expelled? 11. What fundamental difference identifies Good from Evil? 12. How does Knowledge of that difference profit you in living your own life? This book is an exceptional value considering the amount of information that is in it. Very easy to read and just what I was looking for. Anyone on a spiritual path should read this book. Highly recommended. In this lesson you will learn about Affinity of Souls - how you attract others and how others become attracted to you. If you wish to attract others to you this lesson will teach you how. 1. What is the explanation of sudden instinctive likes and dislikes for other individuals? 2. Are they necessarily restricted to your present Human Existence? 3. What Law is manifested through a liking for another individual? 4. How can that Law be observed toward one who arouses your hatred? 5. Why are modern marriages so frequently unsuccessful? 6. What are the two dominant natural motives behind Marriage? 7. Why can they be realized only if two individuals are properly mated? 8. How can Universal Life Energy be used to discover the right mate? 9. How can disharmony be eliminated from married life? 10. What determines the kind of child that will be born to prospective parents? 11. Explain the importance of parents' attitude during the few moments of their Physical Union? 12. How may bad characteristics of children be transmuted into good qualities? The Power of Love, especially Unconditional Love is an extremely important aspect of Universal Life Energy, and one that is fundamental to the very existence of All Creation, and without which nothing could exist for a single moment. Learn all about True Love and what it means to you. At the conclusion of this lesson you will receive an exercise on the subject of HARMONIZATION. 1. What place does Love occupy in the Universe? 2. To what extent does it enter into the activities of Human Beings? 3. Of what practical advantage is Love in Business? 4. How is Love distinguished from weak Sentimentality? 5. Can Love and Discipline be reconciled in the rearing of children? 6. In what way are you directly responsible for the good or bad traits your children develop? 7. How will you profit from the exercise of Love in all your relations with the World at large? 8. What relation do the Negative Passions bear to Love? 9. How can they be eliminated? 10. What responsibility must you fulfil in order to attract the friends and the Life Companion you desire? 11. What part does Love play in physical Rejuvenation? 12. What, briefly, is the scientific explanation of Love? This lesson describes in detail the five fundamentals for living a healthy, happy and productive life at all Triune states of Being. The object of this exercise is to establish in the individual perfect harmony in all Triune states of Being, thereby in turn establishing harmony with Universal Life Energy. 1. What relation does your Triune Human Nature bear to your own Soul? 2. How is Equilibrium to be achieved? 4. What role does Beauty play in the development of your Triune Nature? 5. Where do you look to obtain knowledge of your Universal Source? 6. Why are there exactly Five Statements of Being? 7. What is the Source of your life and the life of everything? 8. From what are all individual intelligences derived? 9. Define Law and its origin. 11. What is your relation to the Universe? 12. What single all-important Lesson is reiterated by each member of your human trinity, Body, Mind and Soul? This final lesson concludes the Science of Being course by summarizing all you have learnt, and what the next phase of evolution will bring for humanity - a phase that you can now be part of as we leave the Fifth Race of Humanity and enter the Sixth Race of Humanity - a process you will wish to participate in. By the time you conclude this lesson you will have learned many secrets to success both with The Law of Attraction, and in Life. By now you will have learned all you need to know to truly live in Happiness, Health and Abundance as well as fulfilling your own true destiny as we experience the transition of the ages from the Fifth to the Sixth cycle of the Human Race and how you can best participate in this process. You final exercise, again an extremely important one is SPIRITUALIZATION. This exercise will culminate in a sense wordless HAPPINESS, PEACE and STRENGTH. 1. What is the motive responsible for the agitation and unrest among the people of today. 2. What movement most vividly illustrates this motive? 3. What is the deeper significance of the conflict between the sexes? 4. Why have women until now been held in a subordinate position by men? 5. How are women proceeding to do away with this distinction? 6. What will be the result if men fail to make the proper countermove? 7. What is the proper counter-move? 8. What is the difference between Refinement and Effeminacy? 9. Explain the alarming increase in Evil today. 10. How does modern Humanity contrast with the Humanity of the Past? 11. What infallible recourse have you amid the trying times in prospect? 12. Has your study of this Course carried to you a sincere conviction of your duty to others with reference to it?